Today I’m 15+4 and not a lot has changed in my opinion since last week. I’m just generally feeling tired and hoping for that second trimester energy surge to come in any day! 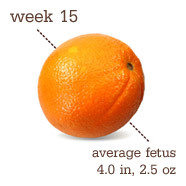 Your baby weighs in at only about 70g. He measures nearly 9.1cm long, crown to rump. You may not know it when it happens, but your tiny tenant frequently gets the hiccups, which babies learn to do before breathing. Your baby’s legs are growing longer than his arms now and all his joints and limbs can move. I’m still feeling tired! I’ve had a bit of a cold but not sure if it’s seasonal or hormonal. Most likely a bit of both. Although my bump isn’t very noticeable I am struggling to fit into some clothes comfortably. Once I ‘pop’ I’ll start posting proper bump updates. 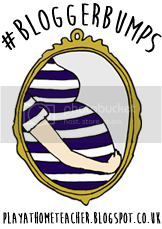 I haven’t found the second trimester to be much different to the first so far. I’m glad to be rid of the nausea and to have a little more energy but I’m still waiting for ‘the glow’! I still haven’t told my colleagues the news but I really want to I just don’t know what to say or how to say it! I’m pretty sure my boss has told everyone but obviously she wasn’t supposed to so it’s a little awkward. Wish I knew how to bring it up without feeling awkward. I have another scan coming up in January and a midwife appointment shortly after that I’m looking forward to. We’ve been thinking about having a private scan but that won’t be until around 24+ weeks. Have any of you had a 4D scan?